April is coming to a close, and we're saying farewell to our flavour of the month, created by Prep Luxe. We first got to know one of Prep Luxe's owners, Jacqueline. Starting as a blow dry bar, they've since evolved to offering full suites of services for hair and make-up. Behind the salon's stunning facade are roots that stem heartwarmingly from the owners' childhoods. Jacqueline tells us, "When we started Prep, we were inspired by a forgotten era - our grandmothers' era, where women would always get their hair immaculately groomed and well-set before they even left the house. In that era there was no such thing as leaving the house without your hair being done properly." That was also the inspiration behind our collaborative flavour, Prep & The Giant Peach. Jacqueline placed an emphasis on the fragrances she remembers her grandmothers using - as she puts it, "75% of emotion is tied with smell. When we thought of our grandmothers' era, we thought of the fragrances that reminded us of them - and it was things like the smell of peach, of rose. That's perhaps linked to the floral and fruity scents they used during their time." And thus, Prep & The Giant Peach was born: white peach sorbet, with a hint of rose, topped with a delicate, crisp, meringue rose. Jacqueline also wanted to bring back many of the understated values from this elusive forgotten era. "The concept of out-giving - now we're always about taking, but they have so much in them that's about giving more than they can ever get back. It's not just about being resilient, but about being anti-fragile when they faced different challenges [in life]. It's about living a life larger than yourself, and that's a very beautiful thing." If you haven't - click to watch the video for Prep & The Giant Peach. This April, we're bringing you a very special PS Collaboration - a flavour dreamt up by Jacqueline Chang, co-founder of blow dry bar & salon, Prep Luxe. Together with two friends, Jacqueline started the unique salon in 2013 and epitomises many values we applaud in our collaboration partners: authenticity, positivity and warmth, and proudly local. Inspired by the strong women of her grandmother's era, Jacqueline wanted to create a fruity, floral flavour. The result: Prep & the Giant Peach, a white peach sorbet with a hint of rose, topped with a hand-baked pink rose meringue. We sat down with Jacqueline to talk about how Prep Luxe's style and her own experience influenced the creation of her fruity flavour. Click to watch April's flavour come to life! This month's flavour is refined, luxurious and a little decadent - a change from the tangy, fruity flavours we've enjoyed recently. We call it The Nutcracker, a homage to Tchaikovsky's ballet: pure pistachio gelato, punctuated with shards of raspberry-infused dark chocolate. Pistachio and dark chocolate is a classic pairing. 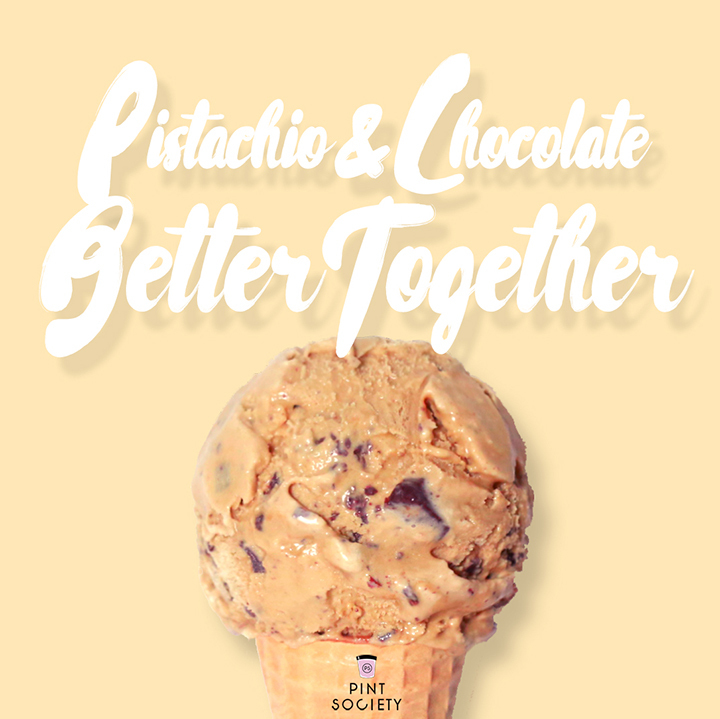 Many of our Pint Society subscribers have requested this flavour profile, and we totally get it; the sweet nuttiness of roasted pistachios and the rich bitterness of dark chocolate are quite the perfect match. Chocolate Ice Magic - sometimes known as chocolate shell - is a wonderful, sweet chocolate sauce that hardens in contact with ice cream. An old-school, almost forgotten ice cream topping, it's what inspired our chocolate shards. Adding a touch of raspberry really elevates this timeless combination, as it gives a playful tartness that cuts through the mellow flavours. The best thing about our raspberry chocolate shards? They melt at a much lower temperature than solid chocolate, or chocolate chips. While chocolate chips are a perennially popular mix-in, they're really just for texture and visual effect; chips harden like rocks and become tasteless when frozen. which means when you eat it, it melts on the warmth of your tongue, exploding with flavour. We think this creation is something even the Sugar Plum Fairy would be proud of! January's Strawberry Creamsicle was the best of two amazing worlds: a marriage between a popsicle and a tub of ice cream! Fresh, fruity, youthful and energetic, it brought us back to carefree summer holidays. February's Marbled Monochrome in contrast, was more complex. An inventive and unexpected combination of nutty black sesame and tart yoghurt that was a treat for both the eyes and tastebuds. Watch how to serve Marbled Monochrome like a pro, with Woo Wai Leong, Masterchef Asia winner, in the post below. We hope our subscribers enjoyed these beautiful entanglements that we took immense joy in creating! We're ready to excite yet again in March, and we hope you are too. Our February flavour was created by none other than Woo Wai Leong, winner of Masterchef Asia. For our first collaboration with a chef, we chose Woo not only for his culinary prowess, but also his warmth, and hearty enthusiasm for all things food. The talented lawyer turned chef & bartender wanted to create an unusual combination for his Pint Society flavour. "It's challenging," he says, "Because it's a swirl, you're going to get a contrast of flavours...but because of the creaminess of the texture, you don't know where it starts and where it ends." The result: Marbled Monochrome. Layers of nutty black sesame are swirled with tangy yoghurt gelato, which Woo shows us how to serve like a pro by using the technique of quenelle-ing. He shares his tips and tricks in our video below. We rounded out 2016 with a comforting flavour, Apple Pie, and we're opening 2017 with a summertime-fresh one - evoking sparkling new memories and the promise of times to come. January's flavour, Strawberry Creamsicle, is a sunny combination of both sharp and soft: tangy strawberry sorbet swirled with vanilla bean ice cream. Next week, these scrumptious pints go out to our subscribers! Stay tuned to watch the behind the scenes process of how this flavour is made. In the meantime - here's a peek at our most recent flavour, Apple Pie. We recreated this heartwarming classic with cinnamon spiced apple pie filling and shortcrust pastry, mixed into a creamy, vanilla bean base. There's just something about beautiful cinnamon - so warming that makes you feel snug, even in ice-cold ice cream. We hope our subscribers loved Apple Pie as much as we did, and we can't wait to hear all of your thoughts on Strawberry Creamsicle very soon! Click to watch Apple Pie's behind the scenes video. Fresh. Tart. Deliciously creamy. That's what we had in mind when creating our January 2017 flavour, Strawberry Creamsicle: tangy strawberry sorbet, layered with gorgeous vanilla bean ice cream. We first heard of combining sorbet with ice cream a few years ago when reading about Pierre Herme's fantastic frozen creations. Only available in summer, Herme mixes zesty, fruity sorbets with earthy, luscious ice creams to create frozen confections that tantalise and invigorate the senses. The genius is in the balance - creamy, milky softness of ice cream is tempered by sharp sorbet, bursting with fruitiness. A little known fact is, a well made sorbet should be as smooth and luscious in texture as an ice cream. There should be no discernable ice crystals (despite the fact that fruit sorbet has no milk or fat content to lend creaminess). We pride ourselves on making such sorbets. Our customers often can't believe they're dairy-free - and upon tasting them, one pastry chef at a luxury hotel here in Singapore once exclaimed that they brought her right back to culinary school, to fond memories of super-smooth, artisanal sorbets. We hope our new take on the classic English summertime dessert, strawberries and cream, will bring a smile to all our subscribers' faces.